The coin belongs to Personalities series. 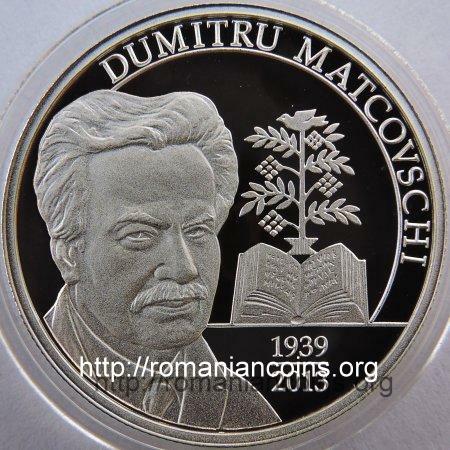 The image on the coin hints at the play "Pomul Vieţii" [Tree of Life] (1977) by Dumitru Matcovschi. 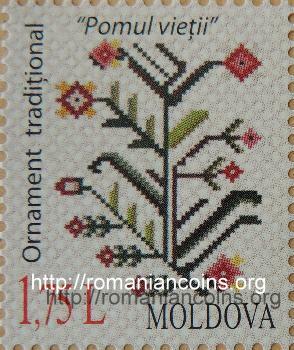 The tree of life is a Romanian decorative motive encountered also in Basarabia. Dumitru Matcovschi was born in 1939, in a village on the banks of River Nistru, Vadul Raşcov, in the county of Soroca, Romania. He is, as restated by the coins's certificate of authenticity also, an emblematic personality of the National Liberation (and National Rebirth) Movement in Basarabia. Matcovschi wrote mainly poetry, but prose also and drama. At their time, Matcovschi's writings kept awake the feeling of belonging to the Romanian nation in the souls of his fellow nationals from the Soviet space, who at the time were politically and culturally separated from the ones in the Motherland. The value of his message brought up the attention of Soviet censorship, which forbade the poetry volume "Descîntece de alb şi negru" [Disenchantments of White and Black] (1969), volume considered, immediately after the issue, as being subversive. In order to understand the importance of the role had by Dumitru Matcovschi in the struggle for national rebirth, it is relevant to mention the accident suffered by him in May 1989, a period of intense engagement, during which Frontul Popular din Moldova [People's Front of Moldavia] was being created: a civic form, with political edge also, of organizing the struggle of the Romanians in Basarabia. The Writers' Union of Moldavia was implied as well, hosting the Founding Congress to the Front. Subsequently to the accident, Dumitru Matcovschi was subjected to a series of surgical operations on the brain; he stayed in deep coma for about half a year, being one step away from death. He has never fully recovered after the accident. The perpetrators of the driving accident - considered by most to be an assassination attempt - were never found. Shortly after the death of Matcovschi, the president of Writers' Union of Moldavia, Arcadie Suceveanu, publicly expressed the opinion that the accident, at the time, had a coagulation and catalysation effect on the fellow nationals: "The drama he himself endured in 1989, this tragic event has energized the masses, has polarized around his name the entire Romanian kin. Thence he became a true hero of the nation, a symbol of dignity and courage [...]” . Thus, a series of unexplained accidents has begun, all of great gravity and stern in aftermaths, aimed at the exponents of Romanian culture in Basarabia, professing its returning to the Motherland, Romania. The spouses Doina and Ion Aldea Teodorovici died during the night of 29th toward 30th of October 1992, close to the village of Coşereni in the Ialomiţa county, due to a road accident after which both the driver and another fellow traveller escaped uscathed. The great poet Grigore Vieru died also due to a road accident which occured in the night of 15th toward 16th of January 2009 close to the village of Dănceni in the raion of Ialoveni. With the tear of our language. For the language of the country.". Poem "Pentru ea" was first published on August 24th 1989 in the periodical "Literatura şi Arta" [Literature and Art] and was sung for the first time by Doina and Ion Aldea-Teodorovici on August 27th 1989 (day surnamed as the "day which will light a century"), at the Great National Assembly at Chişinău, where a crowd of several hundred thousands have demanded the instauration of the natives' language as official language. In an interview from 2012, Matcovschi stated for newspaper "Cuvântul" [Word] in Orhei that "... the Basarabian ever was Moldavian at Nistru and Romanian at Prut, our language was and is the Romanian language, our country, our Motherland, was and is Romania, [...], let us speak the mother's language, let us honour the ancient custom, let us believe in one God, not in bezbozhniks [atheists, god-less, in Russian]” . For his cultural struggle in the service of the Romanian language, the president of Romania conferred to Dumitru Matcovschi the "Cultural Merit” Order in rank of great officer. The festivity, organized by the Department for Romanians Everywhere [Departamentul pentru Românii de Pretutindeni], in partnership with the Romanian Cultural Institute "Mihai Eminescu" in Chişinău, took place on April 25th 2012, in the opening of poetry festival "European Spring of the Poets – 2012". Dumitru Matcovschi was burried with military honours in his birth village, Vadul Raşcov, the day being declared national day of mourning in the Republic of Moldavia (June 29th 2013). 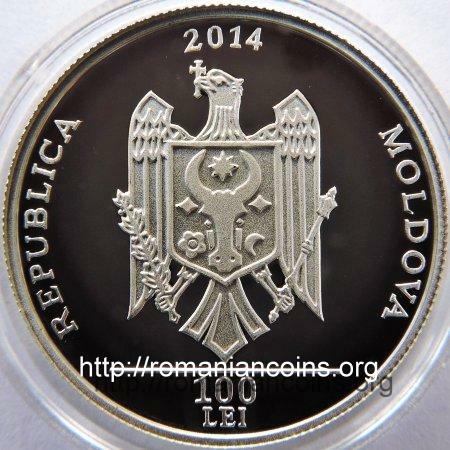 In the Republic of Moldavia, year 2014 was declared as "Year Dumitru Matcovschi" by the Parliament. scumpă icoană în inimi purtată. it guards us from death. and wait for the rain. dear icon borne inside hearts. your are the tear of my people. 1. Iaşcenco T., Dumitru Matcovschi: ”Viaţa este o luptă, cea mai grea din toate”, interviu cu Dumitru Matcovschi publicat în anul 2012 în săptămînalul Cuvântul din Orhei. 2. Ionescu Gabriela., Moartea lui Dumitru Matcovschi - o pierdere imensă pentru cultura şi literatura românească Corespondenţă din 27 iunie 2013 publicată de Agenţia Naţională de Presă AGERPRES.